Does Amsterdam Street Art Goes Further then only Art and Canals? Art + Canals = Water Colours? Amsterdam Street Art Goes Further! Amsterdam Street Art: Amsterdam has always attracted artists and art lovers from all over the world, and continues to do so. Today Amsterdam’s upbeat street-art scenario epitomises the ever-changing artistic trends that characterise this engaging city. Amsterdam is one of Europe’s great art cities, having given the world masterly artists that excite and inspire. Amsterdam’s museums and art galleries are top tourist attractions; art lovers queue joyfully to admire an original Van Gogh or Rembrandt. Also Amsterdam’s abundant street art is a delight for tourists. Amsterdam is an old, culture-rich, historic city of art, as the Dutch Masters testify. At the same time it is a modern, avant-garde, dynamic metropolis. It is in Amsterdam that new trends in art-forms are first experimented. The latest tendencies feature unique and colourful street art, sometimes of gigantic proportions, and often depicting an assortment of famous people, from Anne Frank to Audrey Hepburn to Nelson Mandela. Amsterdam Street Art: To capture the attention of passers-by, Amsterdam street artists have a hard task: they must compete with the charming canals that characterise the city. One eye-catching strategy is size: seriously large always gets noticed! Famous street artist Eduardo Kobra has recently completed a gigantic portrait of Anne Frank (September 2016). It is bright, smiling, colourful, kaleidoscopic, huge (240 square metres) and it looms over Amsterdam’s NDSM district, home to this year’s Street Art Spray Festival. 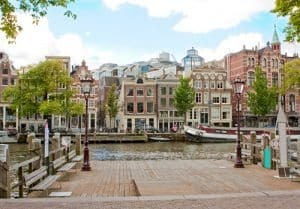 Jordaan is an old quarter with little winding streets, flowering plants and interesting street art that contrasts yet harmonises with the quaintness of the area. The remarkable “Snake-house” is on Spuistraat, an area that boasts a rich variety of murals/graffiti, from rudimentary to sophisticated to surprising. To admire an amazing collection of colourful graffiti, explore the supporting pillars under the Zuiderzeeweg fly-over. For the first time in history, street art comes in off the street and is displayed in a museum. This extraordinary event naturally features Banksy, the grand master of street art, and of course it takes place in Amsterdam, the quintessential trendy city. The Banksy “Laugh Now” exhibition is on display at the Moco Museum until August 2017. The museum is located in the charming Villa Alsberg in the Amsterdam Museumplein, opposite the Rijksmuseum. Art lovers visiting Amsterdam often find they need more time to appreciate all that the city has to offer. In Amsterdam, longer stays are possible without risking bankruptcy: there is accommodation to suit every budget. Hostels are a popular good-value solution. The Sarphati Hostel is worth recommending. Located near the lovely Sarphati Park, and close to museums and the town-centre, it offers top-rate hostel services, including free breakfast, at budget prices.